NASA's hobbled Kepler space telescope is one step closer to resuming its search for alien planets. A proposed new mission for Kepler — whose original exoplanet hunt stalled this past May when the second of its four orientation-maintaining reaction wheels failed — has advanced to a NASA vetting stage called "senior review," agency officials announced today (Dec. 4). "The [Kepler] team must now further validate the concept and submit a senior review proposal that requests the funding necessary to continue the Kepler mission, with sufficient scientific justification to make it a viable option for the use of NASA's limited resources," they added. 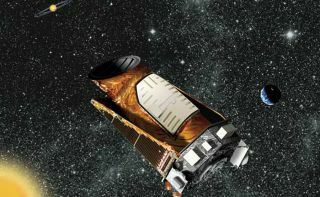 Kepler launched in March 2009, tasked with determining how commonly Earth-like planets occur around the Milky Way galaxy. The $600 million mission has been incredibly successful, spotting more than 3,500 potential alien worlds to date, with many others likely waiting to be pulled from the instrument's enormous datasets. Kepler hunted planets by noting the telltale brightness dips caused when they crossed the face of, or transited, their parent stars from the telescope's perspective. This was precision work, requiring extremely accurate pointing. The loss of two reaction wheels robbed Kepler of its ultraprecise pointing ability, bringing its original planet-hunting activities to a halt. But mission team members have devised a potential new mission called K2 that they believe Kepler could perform despite its current limitations. The K2 mission would continue Kepler's planet hunt, albeit in a modified and limited fashion. K2 would also gather data about supernova explosions, star formation and solar-system bodies such as asteroids and comets, among other things, team members have said. Senior reviews occur every two years; the last one that evaluated astrophysics projects took place in April 2012. In addition to K2, the 2014 senior review will look at the Hubble, Chandra, Fermi, NuSTAR, Spitzer, Suzaku, Swift, XMM-Newton and WISE space missions, NASA officials said. The ultimate fate of the K2 mission and Kepler itself will likely be known by the middle of next year, Kepler team members have said. It currently costs about $18 million per year to operate the spacecraft and analyze its data.